Deep Sea Kelp 1000mg is a source of iodine. The thyroid depends upon iodine to function properly, and to produce adequate amounts of hormones that influence metabolic rate, body temperature, and the regulation of protein, fat and carbohydrate utilisation. Do not take if you have a previous histroy of thyroid disorders exept on doctor's advice. Contains sodium sulfite. No added yeast, gluten, lactose, sugar, artificial colours or flavours, artificial sweeteners, dairy products or animal-derived products. Kelp (Fucus vesiculosus) extract equiv. to dry blade 1000mg containing iodine 240mcg. 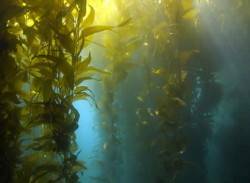 Kelp is naturally rich in the trace mineral iodine. Iodine is required in small amounts for the proper functioning of our thyroid gland.